Rep. Tina Pickett spoke in support of new legislation this week to give small businesses more tools in helping to save for future investments in new facilities, machinery and workforce training. 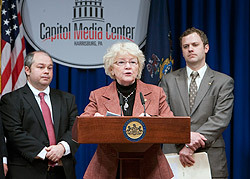 HARRISBURG – In an effort to help small manufacturers across Pennsylvania grow their operations and assist with job creation efforts, Rep. Tina Pickett (R-Bradford/Sullivan/Susquehanna) this week lent her support to a measure allowing small businesses to save for future capital purchases. “This type of savings account could reap significant benefits all around the Commonwealth -- and create and retain small business manufacturing jobs for Pennsylvanians,” said Pickett, a co-sponsor of the measure. House Bill 869, which has bipartisan support, would establish the Manufacturing Innovation Account Program allowing small manufacturers to save tax-free for future investments in new facilities, machinery and workforce training. It is modeled after a similar program in Connecticut. Under the measure, businesses that apply for the program through the Department of Community and Economic Development must have fewer than 50 employees. Accepted applicants would be permitted to contribute no more than $100,000 to its account in a tax year and no more than $500,000 over the lifetime of the account. Accounts would expire after six years in existence, and the participating business would be penalized 10 percent if the account is used for an ineligible expense. Pickett believes that program could have significant success along the Northern Tier. “I can attest to the value of such a program and how we can better leverage the natural resources we already have available for attracting even more industry,” she said. “Small businesses are well known to be innovators, but have discovered that it may be difficult to find capital dollars for growth. This bill offers opportunities to move small manufacturers forward. The proposal is currently under consideration by the House Finance Committee.